It is with great anticipation that I await each and every release by GRIEF; one of the few bands to have successfully tapped into the cosmic aura left by the mighty BLACK SABBATH. An aura that surrounds and permeates all extreme music but somehow still remains elusive to most bands plying the trade. On this new CD the band once again proves that sludge is truly a pliable genre that can be molded and tweaked into countless variations. 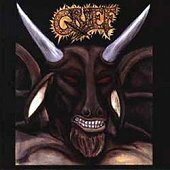 It never ceases to amaze me that although every GRIEF album is built upon the same foundation and has the same overall vibe they always introduce unique elements that result in new and diverse dynamics. One of the strongest of those dynamics on "...And Man Will Become The Hunted" is the pagan celebration of nature over mankind. Everything from CD's title to the Dionysus worship in the artwork to the loathing filled lyrics to the nature samples in the music is in alignment with the misanthropic world view. Although nothing captures the theme quite as effectively as the CDs outro which shows the band stepping away from their rugged metal and playing an acoustic number complete with very non-GRIEF like instruments including congo drums, a piano, and a rainstick. Without question "...And Man Will Become The Hunted" is a worthy edition to the GRIEF opus, which is destined to be legendary.